People who live in regions where there is a real change of seasons know that plants go 'dormant' in the winter and then spring to life again as the weather warms. But a new study found a counter-intuitive effect; instead of a colder winter causing trees to hold off growth for a longer period of time, that happens during a warmer winter, according to an examination of 36 tree and shrub species. The colder the winter, the earlier native plants begin to grow again. If global warming occurs and we get warmer winters, the spring development phase for typical forest trees might start later and later, which gives an advantage to shrubs and invasive trees that aren't as impacted by the cold. This applies above all to native tree species such as beech and oak, because they rely on resting in the cold to protect themselves from freezing by late spring frosts. A different behavior is observed among pioneer species – including shrubs such as hazel bushes and primary settlers such as birch trees – and among species like locust and walnut that have moved in from warmer climate zones. "These trees take the risk of starting earlier in the spring, because they are less strongly dependent on the cold periods," Laube says, "and in addition they sprout more quickly as temperatures rise." There may be consequences for the forest ecosystem. After mild winters, the native species run a higher risk of developing their leaves too late. In that case, more daylight reaches the forest floor, and that benefits lower-growing shrubs and invasive tree species. They sprout earlier, to the detriment of native species: Young trees for example, still low to the ground, may not receive the light they need to grow. "Even under warmer conditions, we won't be seeing 'green Christmases' under freshly blooming trees," says Prof. Annette Menzel, TUM Chair for Ecoclimatology and a fellow of the TUM Institute for Advanced Study. "Nonetheless, the differing growth patterns will affect the entire plant and animal world. The native tree species in our forests have only a limited ability to adapt themselves to climate change." 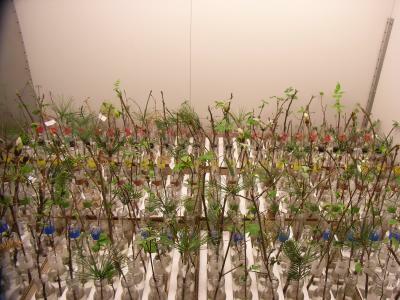 For their experiments, the researchers used twigs around 30 centimeters long from 36 different trees and shrubs, which they exposed to different temperature and light conditions in climate chambers. Each climate chamber experiment lasted six weeks. The twigs came from the "Weltwald" or "World Forest" near Freising, in which Bavarian state foresters have planted stands of trees from different climate regions. The cold effect showed most strongly with the beeches, the hornbeams, and the North American sugar maple. With shortened cold periods, bud burst occurred significantly later. In contrast, the lilac, the hazel bush, and the birch proved to be less dependent on the cold. "Overall, however, a chaotic picture emerges," Menzel adds. "Through warmer winters, the usual sequence of leaf development can get completely mixed up. Many of the cultivated species that are at home today in central Europe come originally from warmer climate zones. In the absence of adequate protection against freezing, they could become victims of their own too-flexible adaptation – and freeze to death in a late frost in the spring."